In last year’s regular-season finale for Kansas State, the Wildcats traveled to Nebraska with the Big 12 North title and a spot in the conference championship game on the line. By now you no doubt know the Huskers won 17-3, which actually knocked a 6-6 KSU team from not only the Big 12 title game but also a bowl because two of those six wins were against FCS schools. I mention that game because Thursday night’s matchup between Nebraska and K-State also seems likely to be for the North title even though it’s only the second conference game for KSU and the opener for the Cornhuskers. If you look at the North, probably only Missouri has a shot to finish ahead of these two. But who knows about the Tigers has they have played a JV schedule. Nebraska and Kansas State are two of five unbeaten teams left in the conference overall. KSU is incredibly fortunate to be a part of that group. The Wildcats have been in dogfights twice in the final minute so far this season. They got a Daniel Thomas 35-yard run with less than a minute left to beat UCLA, 31-22, in the opener. And last time out KSU probably should have lost to Central Florida. The Knights outrushed KSU by nearly 170 yards and held the ball for more than 12 minutes longer. But UCF also missed two field goals and Wildcats QB Carson Coffman scored on a seven-yard run with 24 seconds left for a 17-13 win to move KSU to 4-0 for the first time in seven years. The Wildcats are one of just two unbeaten BCS schools not ranked in either poll. The No. 7 Huskers really haven’t been threatened, but looked like they were not focused at all on South Dakota State last time out in a 17-3 victory. Nebraska turned the ball over three times and was about even in time of possession with the FCS school. But in fairness, that game was sandwiched by a dominant effort at Washington and then this conference opener. Don’t expect a lot of balls in the air as both schools are ranked in the bottom 20 in the nation in passing yards. The Huskers are fourth nationally in rushing, averaging 309 yards per game. They are led by freshman sensation QB Taylor Martinez, who is averaging 124 rushing yards -- 11th most in the country -- and has scored eight touchdowns. He already has broken the Nebraska freshman QB rushing yardage record in a season. Passing-wise he still leaves much to be desired. He was just 6-for-14 for 140 yards with one TD and two picks against South Dakota State, for example. Nebraska might not throw the ball 10 times in this one. Kansas State is allowing a conference-worst 195.5 rushing yards per game. But the Wildcats are fifth nationally in pass-efficiency defense, allowing completions at a 45.6 percent rate and 5.4 yards per attempt. KSU is also a run-heavy team behind Thomas, last season’s leading rusher in the Big 12. He leads the nation in carries per game and is fifth nationally in rushing, but he did struggle against UCF. QB Coffman, who won the starting position during fall camp, has been solid. He has completed 61 percent of his throws for 639 yards with five TDs and two picks. 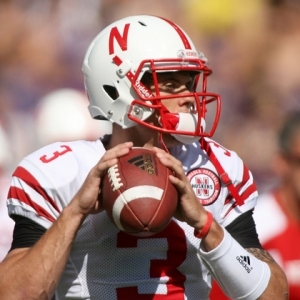 But NU has allowed 120 or fewer passing yards in three of four games this season. Opponents have completed just 16-of-48 passes in the past two games, and one of those opponents was possible 2011 No. 1 overall NFL Draft pick Jake Locker of Washington. The Husker rushing defense hasn’t been as dominant as last year, ranking 38th in the nation. A year ago the Blackshirts gave up just 93 yards a game on the ground. This year, opponents are averaging 154. Nebraska owns a 77-15-2 all-time record in the series between the schools, including a 34-7-2 edge in Manhattan. The Huskers have won the past five meetings. The Huskers are 11.5-point favorites with the total at 50, according to college football point spreads. Approximately 62 percent of the lean is on the visitors. The line opened at 12 at most books, while the total has dropped about a point. NU is 1-2-1 ATS this season. KSU is 2-2. NU has won each of the last four matchups by at least two touchdowns, but I just can’t see that here. KSU will probably keep nine in the box all night and force Martinez to try and throw to beat them, and he hasn’t shown he can do that yet. Huskers win but KSU covers. Despite that ‘over’ trend above I like the ‘under’ as the clock should keep running with both teams running often. Doc’s Sports has become known in nearly four decades in the sports handicapping business as one of the brightest and most successful college football handicappers in the nation and Doc has a big Revenge Game of the Year in college going this weekend and this will be one of the highest rated picks of the season 6-Units. Doc had a monster weekend last week and picked up more than $1,500 for his $100 players. Here ay Doc’s Sports we provide both college football picks and NFL picks in one package so you can get the best of both worlds for all your football betting needs. Check our homepage for up-to-the-minute college football odds and daily exclusive college football betting articles.